LA LENTE has been awarded the ENDESA prize for the best Enviromental section of the newspaper, a national prize given by El País de los Estudiantes. The prize consists of going to Galicia for 5 days including a visit to a mining electric complex of Endesa. We will fly there, stay at a hotel in A Coruña and travel to As Pontes to visit the mine. 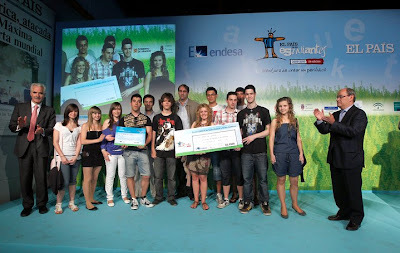 This prize is one of the four big prizes given by El País: there are three prizes for the three best newspapers and this ENDESA prize for the best Enviromental section given by the main sponsor of El País de los Estudiantes. Congratulations to all the students who have written the newspaper and enjoy the trip!!!!!!! !